The Me 262 A-1/U4 Pulkzerstörer is a Rank V German jet fighter with a battle rating of 6.3 (AB) and 6.7 (RB/SB). It was introduced in Update 1.41. The Me262 A-1/U4 Pulkzerstorer "Narwhal" is the standard Me 262 A-1 armed with a single 50 mm MK 214A cannon in the nose instead of four 30 mm MK 108. The main selling point of this plane is its 50 mm destructive cannon. First, accelerate or speed up to approximately 450 km/h on the deck, then immediately climb to the side utilizing the jet's effective climb rate and energy retention. Continue to climb until you reach around 5000 m then build up speed to hunt down enemy bombers. The single 50 mm cannon barrel extends out the nose of the aircraft. The main tactic to use against bombers is a head-on attack or a long-range shot. Aim for the large fuselage, as the 50 mm HEI-T shell will obliterate any plane it hits in one or two shots or kills the pilot. In a deflection shot from above, a 50 mm HEI-T to the wing almost always shreds the entire wing of the enemy or severely damages the wing to the extent a bomber will be unable to fly. A high dive from behind the bomber will offer the biggest and easiest target, but this should be avoided against the B-29. Compared to other fighter-jets the "Pulkzerstörer" has an extraordinary long range hitting power. A long-range shot can be attempted! Do not be afraid to shoot from up to 1.2 km away, as the 50 mm is very accurate especially when the upgrade is unlocked. Furthermore, AI gunners will not engage you if you are attacking from farther than 660 m.
Unlike the other Me 262s the MK 214A has a great bullet trajectory making shots above 500 m (1,600 ft) very easy. Even shots up to 1,500 m (1 mile) are a common feat and unlike the American .50 cal M3 Browning the hitting power does not decline over distance. The Mk 214A 50 mm cannon has extremely low accuracy in stock configuration. Unlocking the upgraded cannon is a must. When used against ground targets, use the HVAP shells. They can destroy Heavy Tanks if shot in the sides, rear, or roof. Pillboxes can be killed using a high-angle dive (shooting through the roof), just make sure you pull out in time. in Ground Forces, use the same tactics. A skilled pilot will use the standard AP-T rounds and aim more carefully against the weak points of a tank; the AP-T contains an explosive filler which is more likely to detonate ammo or ignite fires. HVAP is extremely effective against ground targets and can penetrate up to 108 mm within 500 meters. However, it lacks any explosive filler. Shots to planes will almost always result in the shell going straight through the plane with little or no damage. That being said; shots to critical components on planes such as wing spars or the fuselage may result in that component being blown off entirely. The HEI-T (Minengeschoß) will obliterate any plane on the first or second hit. If even one shell lands on an enemy, the enemy plane is at least critically damaged and will likely crash over time. Only in rare cases will this shell fail to bring death upon an enemy on the second shot (such as shooting the very end of a wing or elevator, or a heavily armoured fuselage). The B-29 is the only tough nut to crack with this ammunition due to its sheer size; aim for the wings or engines. Aim well, and you will be rewarded. Do not overcompensate for the lead when aiming for planes- the 50 mm travels very quickly and in most cases (under 600 meters) only a little lead is necessary. Against piston-fighters, energy advantage is a must- as with the standard Me262A-1. Do not dogfight with piston aircraft. Use energy tactics- always boom and zoom. Against fighters it is important to monitor ammunition as the Mk.214a only has 32 shots before a reload is needed. Most passes will only allow you to take 2 or 3 shots before you must reset the position and try again. Head-ons are a viable tactic (some enemies will fear facing a 50 mm and will actively try to avoid doing so), but engage from a long distance- even if you survive the pass, the Narwhal has very fragile engines. Jet fighters are the biggest threat to the Narwhal. All jet-fighters will out-climb and out-accelerate you, and your gun has a very slow rate of fire. Thus, the Narwhal is often seen as a free kill. 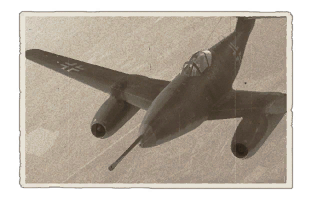 However, the Me 262 family is known for being manoeuvrable at low-speeds when compared to other Jets at its tier. Use your superior low-speed agility to avoid as many passes as you can, then punish a greedy enemy with a well-aimed 50 mm shell. Research the ammo belts ASAP! The mixed ammo belt is a nightmare. The stock ammo line up (HE(M)-T + HE-T + APHE) has only one effective anti-air round, the other two lack the one-shot ability for such a precise weapon. Unlocking the belts and the 'New 50 mm Cannon' should be your highest priority, as the stock cannon has a large dispersion radius which nearly requires the pilot to shoot within 500m for an accurate hit. After this compressor and engine should be the next target as each one improves the acceleration of the "Pulkzerstörer" which is due to the design of all Schwalbe jets just short of awful. The remaining upgrades can be chosen at leisure. The cannon is not prone to overheat and top speed is not something to worry about as the 262 can only reach it with a dive anyway. Low rate of fire, especially considering that it will be facing a lot of fast-moving jets and nimble prop aircraft which is not the primary target for the 50 mm gun. This page was last edited on 20 February 2019, at 04:42.